This week we experimented a little further with jelly,oats and some very ripe blueberries. Inspired by Jennie at Edspire. We adapted Jennie's idea for table top play, simply because that currently works better in the space I have here in my home. 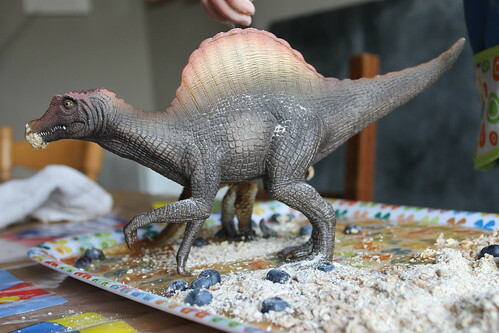 I have a collection of plastic and metal tea trays that work well for most messy play. Cornflour gloop can be poured and dripped onto them, then drawn in. Rice makes a lovely tinkling sound as it's sprinked, and they do tend to contain most of the mess, most of the time. 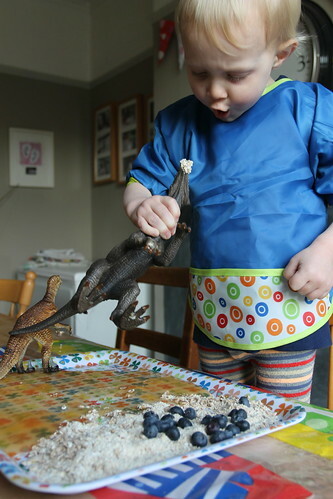 Other useful messy play equipment are plastic bowls in a range of sizes, wooden spoons,whisks,spatulas,measuring spoons,and funnels. I usually raid the kitchen cupboards, but I'm always on the lookout in bargain shops for anything I might be able to use. Water play is always nice and quick to set up. 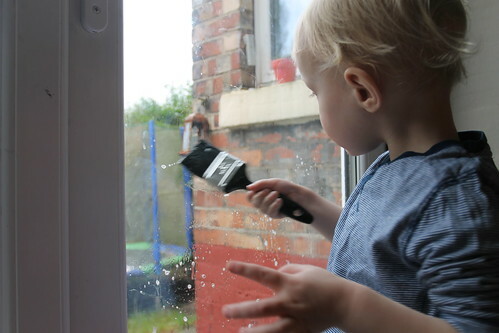 Yesterday I put down some old towels, gave the boys a washing up bowl with some soapy water, and two large paintbrushes and let them loose on my patio doors. 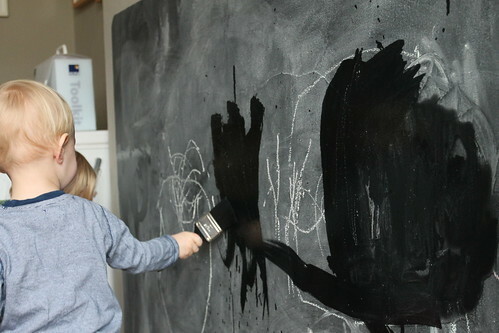 Usually I give them sponges for this activity, which makes lots of lovely suds to draw in, but they enjoyed using paintbrushes, and soon realised that wet paintbrushes work very well on the chalkboard too. 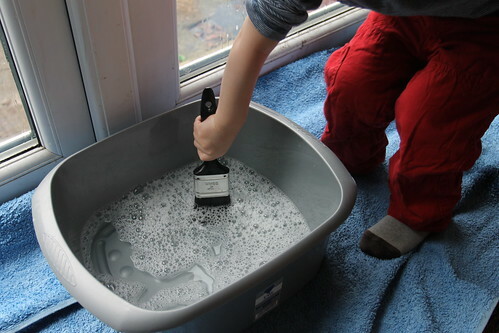 It's so easy to adapt this water play with coloured foam, and different cloths, sponges or brushes. Something, no doubt we will experiment with. Once the boys were tired of using their brushes. I gave them clean cloths to dry their windows....bonus for me is cleaner windows! NB Cornflour gloop is simply cornflour mixed with a little water until it's a gloopy consistency. Cloud dough is plain flour mixed with baby oil until it starts to form a dry ball when squeezed. You don't want it wet. It's quite a dry mixture that forms shapes under pressure, but then crumbles easily, rather like moon sand.